Vermont’s sixth annual Free Ice Fishing Day is Saturday, January 26, 2019. The day is geared toward giving new ice anglers an opportunity to try ice fishing before purchasing equipment, but any angler may ice fish on any waterbody open to ice fishing statewide without a fishing license. 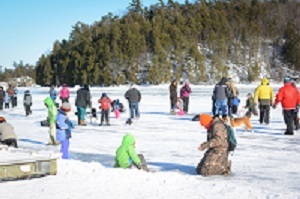 To celebrate, the Vermont Fish & Wildlife Department is holding an Ice Fishing Festival at Knight Point State Park in North Hero, Vermont. The festival will be held from 11 a.m. to 3 p.m. The event is free and open to all ages as well as families with kids. Vermont Fish & Wildlife staff, as well as instructors from Vermont’s Let’s Go Fishing Program, will be on-hand to teach ice fishing skills. These include knot tying, baiting and using an ice fishing rod, and most importantly, how to stay warm on the ice. They’ll also discuss fishing regulations and go over fish identification. Rooted in Vermont will also be there to talk about the importance of locally-caught fish as a sustainable source of food. And new this year, the Coast Guard will be performing self-rescue demonstrations through a hole in the ice! Department staff will operate a fish fry station to cook up participants’ catch, and there will also be other refreshments on hand including plenty of hot cocoa. There will be several warming huts available. The Fish & Wildlife Department will lend equipment needed for this fun day on the ice, or participants may bring their own equipment. For more information, contact Corey Hart at 802-265-2279 or corey.hart@vermont.gov. Registration can be completed online in advance at https://www.register-ed.com/events/view/132707 or people may register when they arrive, although registering in advance will enable participants to get on the ice faster! Free Ice Fishing Day and the Free Ice Fishing Festival are held annually on the last Saturday in January.